In a new interview shared on DC’s website, James Wan detailed the inspiration for his forthcoming Aquaman movie, starring Jason Momoa as Arthur Curry. Aquaman, like many of his fellow heroes, has never been reliably cool or cheesy—he teeter-totters back and forth tonally. Wan and his team are hoping to include all parts of the character’s history in their film in some way, from the badassery all the way to the seahorse riding. 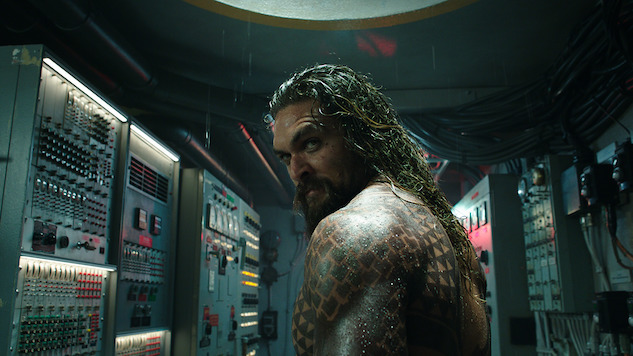 In the interview, Wan cites Greg Rucka’s and Ivan Reis’ Aquaman comic as the most influential in terms of “spirit and story.” He loves the politics that have defined modern Aquaman stories, especially the Atlanteans’ deep mistrust of surface dwellers. However, Wan goes back to the early material for inspiration, too. The Super Friends bits, in which Aquaman’s evergreen solution is phoning in a whale friend, are some of his favorites. Somehow, Wan hopes to find a home for both the serious and the silly in the Aquaman movie. Wan is across the board when it comes to genre, too. He says he’s using the Aquaman mythology to pull together all things Ray Harryhausen, early Spielberg and Romancing the Stone. He wants to use the “action-packed, swashbuckling adventure” umbrella to cover it all. His wide range of experience might help him out: He’s got Saw and Insidious on his resume, right alongside Fast and the Furious 7. To Wan, the movie is like the ocean. He says it can be both terrifying and mystical; that metaphor is his bridge between what seem like contradictions in the plot and tone. At this point, Aquaman sounds like the Venn diagram of Adam West’s and Christian Bale’s Batman portrayals. They’re both good on their own, but who knows what’ll happen when they’re put together. After several decidedly “meh” films, and the departure of both Ben Affleck and Henry Cavill, DC’s movie franchise needs another win desperately. Even the success of Wonder Woman has been drowned out amongst all the bad PR. Hopefully, Wan and the Aquaman crew can break the curse. If you haven’t seen it yet, check out the equally off-the-wall trailer below. Aquaman is coming to theaters Dec. 21.